This patch allows you to compile Papyrus scripts when using the Creation Kit in conjunction with Mod Organizer when you're using a 64-bit computer. Thanks to Tannin42 for discovering this fix. 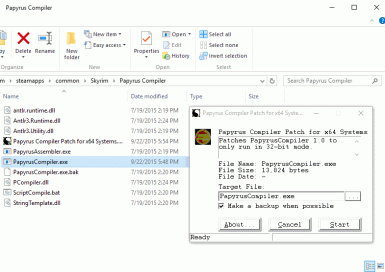 Extract Patcher to the Papyrus Compiler directory inside the Skyrim folder. 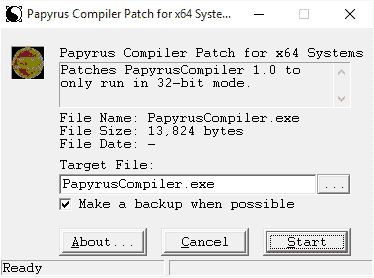 Run Papyrus Compiler Patch for x64 Systems. Read log to verify file was successfully patched. A backup shall be created with a .BAK file extension. If you run into a permissions issue (possible even if run as admin), try copying both the patch and PapyrusCompiler.exe to your desktop and execute there, moving the new files back to this directory once complete. Delete PapyrusCompiler.exe from the Papyrus Compiler directory inside the Skyrim folder.